over-draped canopy is superseded by a light and graceful structure thoroughly in keeping, both as regards proportion and design, with the rest of the bedstead, and entirely free from that extraordinary medley of French, Chinese, and other nondescript detail which went so far to mar the productions of the preceding period. The bed illustrated on Plate VII. was, in one of its renderings, draped with dove-coloured satin, lined with green silk, and so " dressed-up" must have presented a very gay appearance. Figs. 12, 14, and 15, on the same plate, are designs "suitable for cornices for either beds or windows"; while above, in Figs. 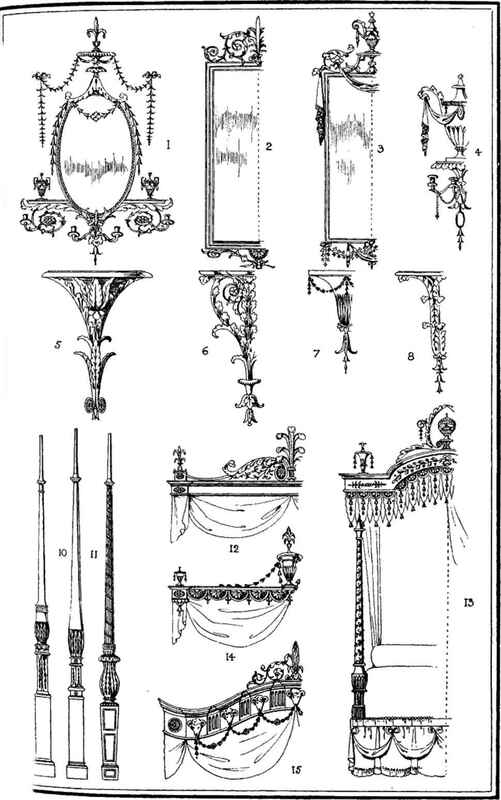 1 to 8, are a girandole, wall mirrors, and three or four brackets. It was in articles of this fancy class that this designer employed most freely the decoration of a finikin, almost "wiry," type, to which I have already referred. They were finished in gilt, and burnished, or coloured in order to accord with the tones predominating in the room for which they were intended. They were telling enough in their way, it is true, and helped to give an effective finish to the complete schemes of furnishing of which they formed a part; but they cannot, in my opinion, be so highly commended as most of Heppelwhite's productions. Their ornamental detail throughout is of a character far more suitable in every respect for execution in marquetry or painting than in pierced carving, their production in which is undesirable. The delicate festoons, swags, scraps of drapery, and foliations would, and do, snap off at the least provocation. But enough has been said on this head. existence at the time of which I am writing. 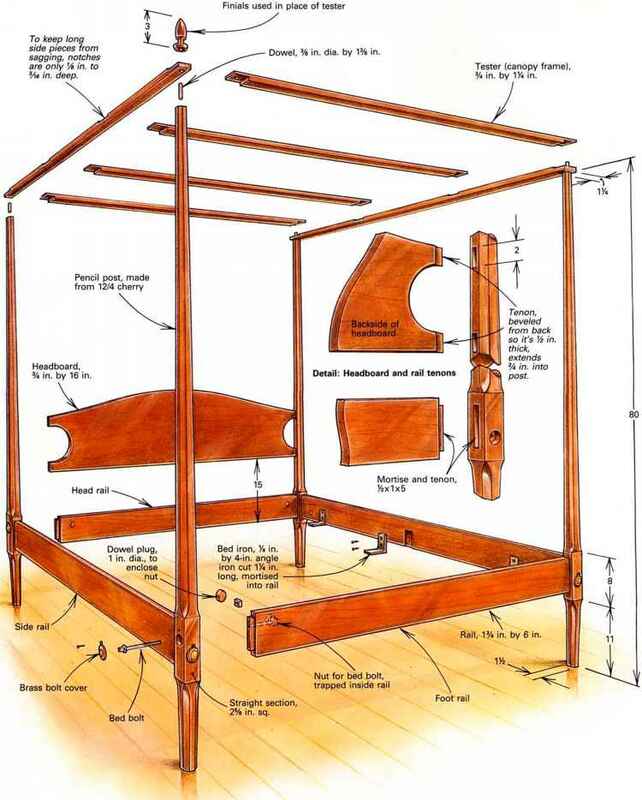 Fortunately— speaking, of course, from the artistic standpoint—the elaborate conglomeration of shelves, spindles, brackets, and bevelled mirrors, all too well known to us to-day, found no place in the calculations of the eighteenth-century cabinet maker. If he added any superstructure to his " sideboard " proper, he was content with introducing merely a more or less ornate brass railing or gallery at the back and sides, sometimes supporting candelabra, in order to give a "finish" to the woodwork, and to serve as a support for the display of plate. The modern sideboard not infrequently has the appearance of being chiefly an object lesson in the skill of the glass-beveller and silverer ; but matters are improving in this direction, and one of the chief reasons for this is the return of the twentieth-century cabinet maker to the study of eighteenth-century models. The sideboard in any form, as distinct from the "side-table," as a matter of fact, was quite a novelty even at the period when Heppelwhite's book appeared. In writing of it that designer states : " The great utility of this piece of furniture has procured it a very general reception, and the convenience it affords renders a dining-room incomplete without a sideboard."